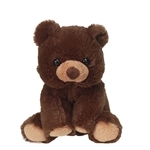 Brown bear stuffed animals make great companions. Their loyalty and ability to provide comfort and security is top notch. These stuffed brown bears, including stuffed grizzly bears, are more than capable of becoming the number one stuffed animal in your life. Believe me, I've seen them do it! If you would like to see the plush grizzly bears all by themselves, simply type 'grizzly' into the search box. 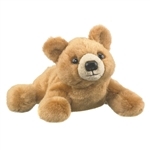 Otherwise, you can browse all of our brown bear stuffed animals below. These plush North American brown bears are ready to leave the cave, to make some new friends, and to have some amazing adventures. If you or anyone you know could help them on their journey that would be fantastic. Our stuffed brown bears would love to go on vacation with you to Yellowstone National Park, or maybe Alaska, to see some of their distant relatives but they'd also be just as happy watching Yogi Bear cartoons with you on a nice comfy couch. These wonderful brown bear and grizzly bear stuffed animals are up for anything and they hope that you are too!